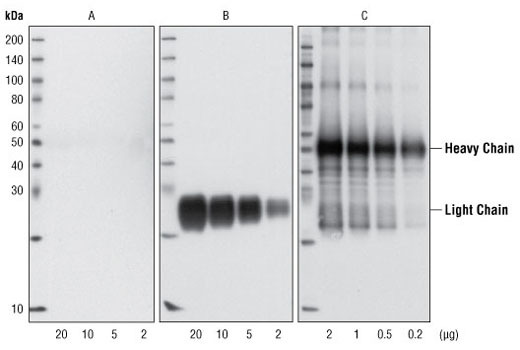 Western blot analysis of decreasing concentrations of total rabbit IgG, reduced and denatured in 1X SDS loading buffer with DTT, using Mouse Anti-rabbit IgG (Conformation Specific) (L27A9) mAb (Panel A), Mouse Anti-rabbit IgG (Light-Chain Specific) (L57A3) mAb #3677 (Panel B), or Anti-rabbit IgG, HRP-linked Antibody #7074 (Panel C). For Panels A and B, the bound mouse anti-rabbit IgG mAb was detected using Anti-mouse IgG, HRP-linked Antibody #7076. The positions of the reduced and denatured rabbit IgG heavy and light chains are indicated. Mouse Anti-rabbit IgG (Conformation Specific) (L27A9) mAb: (#3678). Incubate membrane with Mouse anti-Rabbit IgG (Conformation Specific) (L27A9) mAb (#3678) (1:2000) in 10 ml of blocking buffer with gentle agitation for 1 hour at room temperature. Affinity purified mouse anti-rabbit IgG (Conformation Specific) antibody. This product has been optimized for use as a secondary antibody in Western blotting applications. Mouse Anti-rabbit IgG (Conformation Specific) (L27A9) mAb recognizes the native rabbit IgG. It does not recognize the denatured and reduced rabbit IgG heavy (about 50 kDa) or light (about 25 kDa) chains on western blot.